This Hotel is Currently Trending! Currently rated at 82% compared to its all time rating of 82% and ranking at 2 of 866 hotels (up 348 places from 350) based on reviews in the last 7 days. Nearest: Tube Station: Tottenham Court Road 264 yards (241 metres), Railway Station: London Charing Cross 0.7 miles (1.1 km), DLR Station: Tower Gateway 2.4 miles (3.9 km), Motorway: M1 Junction 1 5.7 miles (9.2 km). There are 7 tube (underground) stations within half a mile (0.8 km). The Radisson Blu London is situated in Bloomsbury, close to Holborn and Covent Garden and well located if you need access to the City of London (financial centre) just beyond Holborn. Bloomsbury itself has a literary background with many famous writers having lived in this area. The heart of the West End and the Theatreland of London is also easily accessible from here and Oxford Street is just 200 yards walk away. The British Museum is also around a 200 yard walk to the east. There are plenty of shops and bars in the surrounding vicinity and of course the best of London's nightlife is just 400 yards away from Soho on. Here you will find endless clubs, bars and restaurants and a host of theatres. There are 16 theatres within 1/3rd of a mile. A selection of nearby attractions include Ben Uri Art Society and London Jewish Museum of Art (0.1 miles), Curzon Soho Arthouse Cinema (0.2 miles), Leicester Square (0.3 miles), Planet Hollywood (0.3 miles), Trocadero Centre (0.3 miles), Piccadilly Circus (0.3 miles) and Ripley's believe it or Not museum (0.3 miles). welcoming and calming the Radisson Blu Kenilworth hotels decor is one of rich colours, fine artwork and designer furniture. Suited to business travellers thanks to its close proximity to the financial area and to leisure traveller with its location on the edge of the west end. All rooms have air conditioning and have been ergonomically designed to give guests a clean, clear and comfortable space to make their own. Bedrooms feature African walnut beds and wardrobes, bespoke wallcoverings and crisp cotton bed linnen. Bathrooms are clad in Sicilian carrara marble with Jacob Delafon bathware. Each room features European plug sockets, advanced telephone systems with your own personal telephone number and voicemail. 'In hotel' mobile phones are available on request. Standard amenities include minibar, trouser press, safe, satellite television with pay movies, tea/coffee facilities, safe, US 110v plug sockets and complimentary wireless internet access. Security is high with CCTV, throughout, and floor access is by room key only. Deluxe bedrooms are larger and have a seating area and bathrobes. Junior suites are all individual and have specially commissioned furniture from French designer Edouard Rambaud, Designers Guild fabrics and hand painted silks from Noblis Fontan. Separate seating area with Bose sound system and DVD player. There are 2 disabled bedrooms suitable for wheelchair users and visually impaired guests. Also onsite is the Creation Bar and Restaurant. You'll discover delicious modern British cooking which has just a hint of Far Eastern influence. This cool and comfortable dining room features a glass divide between the diners and the kitchen enabling you to see the chefs preparing their creations. Also incorporates a stylish bar. The Radisson Kenilworth hotel features a fitness room and there is a fully equipped Business Centre in the adjacent Marlborough Hotel. Front reception is open 24 hours. Hotel services include concierge team, luggage storage, currency exchange and dry cleaning/laundry. There are 8 function rooms suitable for up to 100 guests. Radisson Blu Bloomsbury Street Hotel: is 82 yards (74 metres) away, has a guest satisfaction score of 82% and rates start from about £136. Radisson Blu Mercer Street Hotel: is 0.3 miles (0.4 km) from here, earns a customer rating of 89% and base rates begin at about £175. Radisson Blu Hampshire Hotel: 0.6 miles (0.9 km), rated at 89% and with rates from around £155. Radisson Blu Grafton Hotel: 0.6 miles (1.0 km), rated at 82% and with rates from around £91. Compared to other London hotels: This hotel has been rated 82% by past guests (however its currently trending higher, see note at the top of the page for its 7 day ranking). The London average is 80% and the average for 4 star hotels is 83%. Therefore although the hotel is above average for London as a whole this hotel is below average for its sector (star rating) . Radisson Blu Hotels across the chain average 83% so this hotel is slightly below the guest rating for most Radisson Blu hotels. 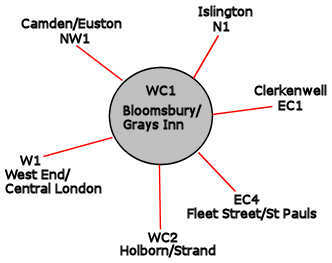 The closest fifty hotels around this area (97 Great Russell Street, WC1 postcode) that are listed on this website cover a 0.5 miles (0.8 km) radius. The numbers for each star rating are 8 five star hotels (average rating 92%), 24 four star hotels (average rating 85%), 14 three star hotels (average rating 79%), 2 two star hotels (average rating 75%) and 2 one star hotels (average rating 62%). The highest rating goes to Montague On The Gardens Hotel (4 star), the Covent Garden Hotel (5 star) and also the Soho Hotel (5 star) (all joint top with 99%). Base Rates: Here we breakdown the starting rates (base rates) by overall average and by star rating. However base rates do not take account of special offers and one off deals so are just a guide. If we look at the average for all hotels in the area (nearest 50) we get an average base rate of £136 per night. The lowest rates are at £18 at SoHostel (2 Star, 80%) and highest base rates of £363 at Rosewood London Hotel (5 Star, 98%). Averages for each sector of star rating: Five Star average: £276, Four Star average: £131, Three Star average: £91, Two Star average: £38 and One Star average: £53. We rank hotels based on their guest rating but balanced for their influencing factors. We have ranked Radisson Blu Kenilworth Hotel 22nd (joint) of 50 nearby hotels and 12th (joint) for the 24 four star hotels in the area. Our ranking for sheer lowest base rates is 27th of 50 (9th of 24 four star hotels.). We calculate an overall ranking combining the rates and rating scores. This hotel ranks 30th of 45 for pure value for money (SoHostel was top).